An unexpected bill. An upcoming doctor's appointment. A tense family visit. Every day struggles of all sizes creep into our lives, leaving us stressed. Frustrated. Anxious. Just plain miserable. The believers in Philippi were struggling. They were trying to grow in faith and live for Christ. Trying to deal with conflict and threats of persecution. The apostle Paul was stuck in a Roman prison when he wrote to this young church. His letter could have focused on his own troubles. Instead he wrote about living a life full of joy, peace, and contentment. He reminds us of important biblical truths and points us to Jesus as the ultimate example. Paul's letter encourages. It inspires. His confidence reminds us of God's wisdom and control in the difficult moments of life. His excitement challenges us in this guide to joy. 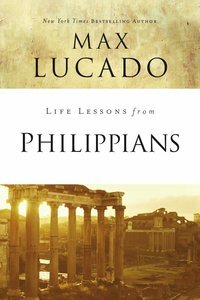 About "Philippians (Life Lessons With Max Lucado Series)"